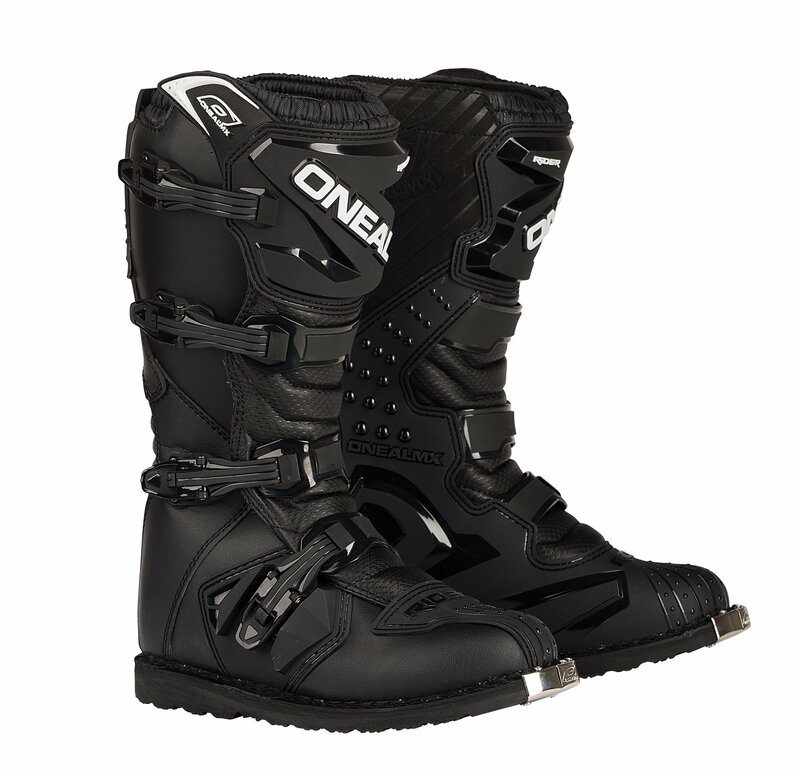 1 What is exactly motocross boots? 2 What are the benefits of motocross boots? 3 What are the materials of motocross boots? 4 How to measure your boot size? 5 Are motocross boots waterproof? 6 What kind of socks should be worn with motocross boots? 7 Do I need metal toe ends? 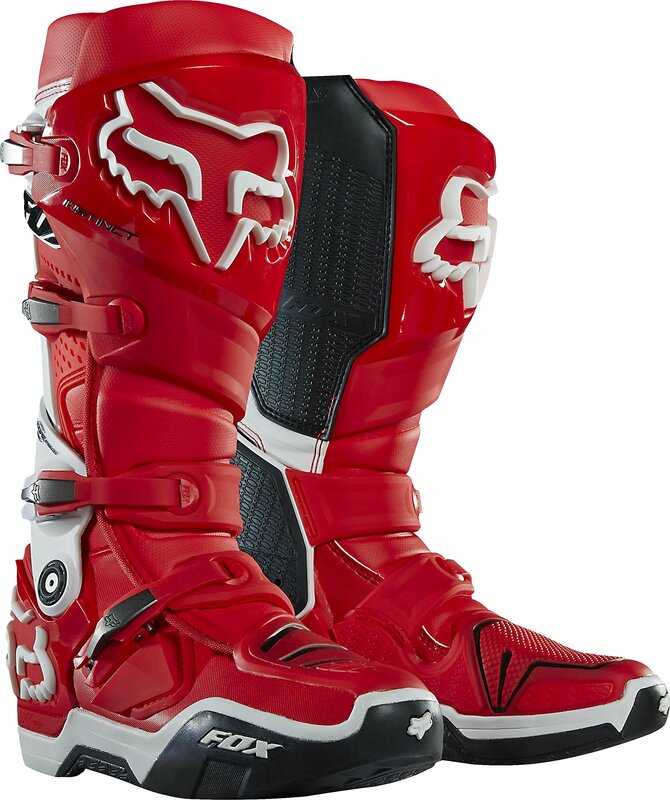 8 What are the famous brands of motocross boots? 9 What is the average price of motocross boots? 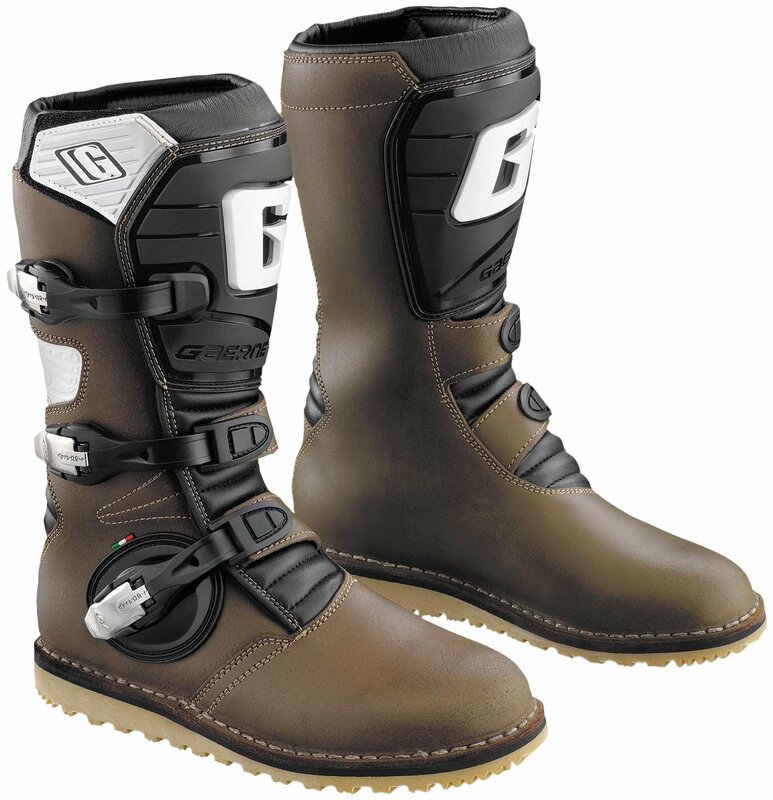 10 What are the main factors to choose a good motocross boots? 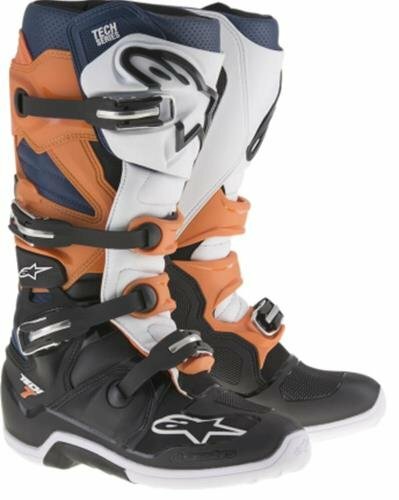 11 What Are the Motocross Boots Reviews on the market 2019 ? 12 How to keep motocross boots in good conditions? What is exactly motocross boots? Dirt biking requires concentration, finesse, strength and a whole lot of protective gear. If you were to rank each piece of protective gear then helmet would be the first choice followed by motocross boots. As your feet, ankles and calves bear the brunt of this high-speed sport, motocross boots provide the best protection. The boots are reinforced with elements such as polyurethane, steel and extra padding. This provides the strongest defence and comfort for your feet. What are the benefits of motocross boots? Your feet could get slammed against hot engine, trees, boulders and other dirt bikers. Every time you crash, you can suffer from serious injuries to feet. Bike riders use their feet as anchors when cornering and to prevent falls. This can cause a lot of high speed impact on your feet. As you ride faster, higher and more treacherously than ever, boots offer maximum protection from injuries to your feet and ankles. There are more than two dozen bones that form part of your feet and ankles and they need protection and support to withstand high impact. The boots make you feel comfortable and enable you to ride confidently. What are the materials of motocross boots? 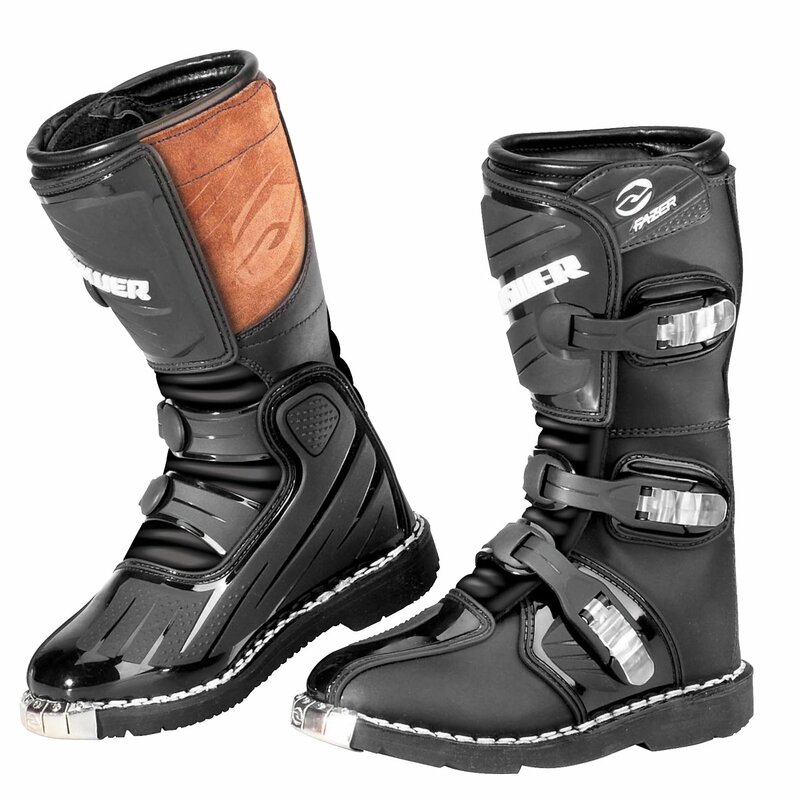 Motocross boots are usually made by combining metal, plastic and different types of composite materials. You can make the choice of material depending on your personal choice, requirements and budget. Boots with aluminium and steel plates offer protection but they can be heavy. Plastic plates are much lighter than metal plates and can help protect your feet. Some bikers don’t prefer boots with plates as they consider them uncomfortable. The composite plates and curved plastic cover the shin of the boot and this protects the biker from debris. Boots made from synthetic materials are durable but expensive. Leather boots are comfortable and stylish. The nearly knee-high boots are designed using different types of material to provide maximum protection and comfort. The rubber based composite soles are oil resistant and this gives bikers grip on the pavement and enables them to keep their feet on the pegs. The form fitting boots are easy to get on and off. How to measure your boot size? Size is extremely important when choosing motocross boots. If the boots are of the correct size they will be able to create a protective shell around your foot and ankle. This can help protect your lower feet against any kind of injuries. It is advisable to measure the foot while wearing riding socks, so that you are able to determine the correct size. American boot companies measure size in inches whereas European companies measure size based on centimetres. You can make use of a size chart to find the correct boot size. One of the important things you need to remember is that brands have their own specific size charts. You can refer these charts when choosing brands of your choice. Avoid choosing small sized boots as they can cause discomfort. Similarly, if you choose large sized boots they may not fit properly and will not be able to protect your feet. You do need to know that not all motocross boots are waterproof. Boots that are made of leather are designed to be exposed to water but they should not be soaked in water for extended periods of time. Nylon and polyester are also waterproof materials that are used to make these boots. What kind of socks should be worn with motocross boots? Even though a pair of socks may seem unimportant, they are vital if you want your feet to be properly protected. The right socks can cradle your feet and keep them protected at all times. You should never feel friction or wetness when you wear them. They need to be comfortable and should be reinforced in the ankle and heel. Do I need metal toe ends? Protection is one of the main features that you need to look for when choosing motocross boots. Metal toe ends with steel can help reinforce the toe and heel guards. The toe ends can protect your feet from rocks and soil on the road. The only drawback is that they will scratch the saddle as they speed along the dirt road. What are the famous brands of motocross boots? 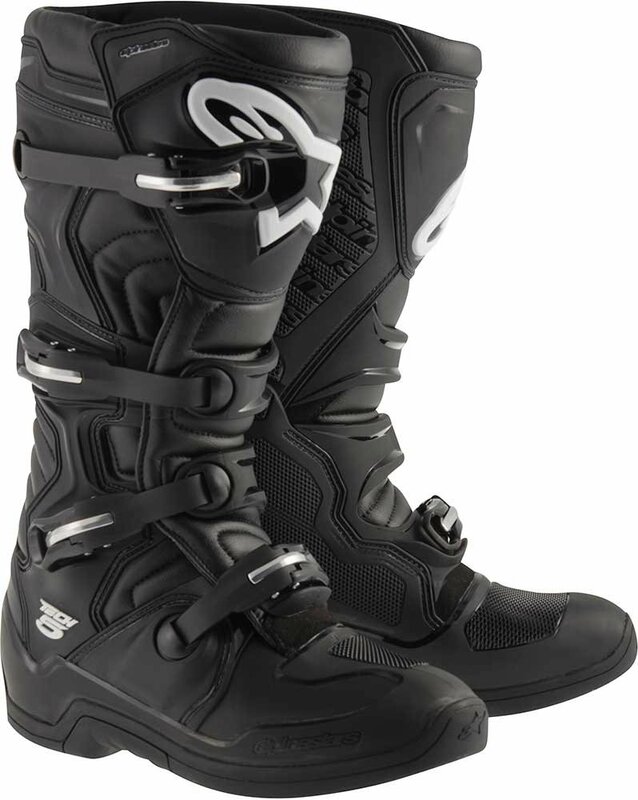 The best motocross boots provide the best fit and protection that you need for a safe ride. The most famous entry level brands include Fly Maverik, O’Neal Rider, Thor Blitz, Axo Drone and Answer Racing Fazer. The famous intermediate and premium level brands include Sidi, Berik, Fox Comp Alpinestars, Gaerne and Thor Ratchet. What is the average price of motocross boots? The entry level motocross boots cost around $100 and just because they are budget friendly doesn’t mean they are made of cheap material. All major manufacturers make high quality entry level boots. The middle level boots cost around $200 and high-end boots over $300. You can make the choice of boots depending on your level of riding. What are the main factors to choose a good motocross boots? – You should always choose the correct boot size, so that it is easy to slide your feet in and out of the boots. It is advisable to check the boot manufacturers chart size before making the choice. One of the important things that you need to know is that American boot companies measure the size in inches whereas European boot companies use centimetres. – As protection is the main feature of a good pair of motocross boots, the material used to make them is important. The material used is a combination of composite and other materials like leather. The extra thick leather is breathable and abrasion resistant. The light materials are cheap and comfortable but they will not be able to offer the kind of protection that a biker needs. If a biker wants boots that are waterproof they can choose treated leather that are more likely to repel water. Most boots use metals such as steel to reinforce the heel and toe guards. This can offer great protection to the feet but also adds weight to the boot. Low cost boots have plastic armor but they offer less protection than steel armor. – Closure mechanisms hold the entire boot together. Buckles, zippers and adjustable straps provide additional comfort and keep the boots securely in place. The multiple locks ensure that the boots are secured at all times. The zippers give a snug fit to the feet. They slide up and down easily but don’t sag or fall down when riding. Metal zippers are considered to be more reliable than plastic ones. Most boots have three or four buckles that are adjustable. – Most boots come standard with the 2-year warranty. Extended warranty is also offered by some manufacturers to cover crash damage. – You can make the choice of boots depending on your level of riding. There are different pairs of boots depending on your level of riding experience. Boots are specifically designed for beginners, intermediate and expert level bike riders. What Are the Motocross Boots Reviews on the market 2019 ? The O’Neal Rider Boots come with a completely new design featuring four buckle configurations. Metal toe caps, inner heat shields and molded plastic shin plates offer protection. These boots enable you to get adequate protection within your budget. They are an ideal choice for beginners. Great looks, stellar performance and excellent price make it a favorite choice of most bike riders. The design of these boots focusses on providing you maximum comfort and protection. The metal shank inserts reinforce the boot shape and adds support to your foot. The adjustable four buckle closure system is easy to operate. It enables you to get in and out of the boots easily. The wet sole is properly balanced and includes a traction heavy pattern that is ideal for walking. The moderate grip sole cushions and provides excellent grip. The injection molded plastic plates helps protect against impacts. The synthetic leather shield prevents heat damage to your feet. The air mesh interior, cushioned insole and generous heel support provide extra support. The rear pull tab provides extra leverage. Metal toe guards protect the sole of your foot. Buckles and replacement straps are also available. The Frazer boots have been designed and engineered to feature all the details that are usually available on high end boot models. It is available in different youth sizes. Look at the manufactures size chart so that you are able to choose the correct size. This can enable you to get a perfect fit for your feet. The genuine leather material provides good ankle and foot protection. The four locking buckles and welted sole ensure grip even as you drive fast off the road. The ample interior padding makes it comfortable to wear the boots for long. The high-performance boots are attractive for an entry level price. The boots are made using polyurethane and genuine cowhide. This offers adequate protection against high impact injuries. The interior padding providing exceptional comfort and fit. It features light and durable plastic and lock buckle. The suede exterior calf shield helps protect the boot from hot exhaust header of the bike. Insoles go a long way in providing safety and comfort for your feet. The entry level AXO Drone boots are constructed using high quality materials that have been specifically chosen for their strength, weight and value. It has a generous toe box that provides additional comfort to your feet and ankle. The construction of the boot provides safety and durability. The synthetic materials that make up the boot’s main body provide abrasion resistance. The rigidity of the material aids in supporting your foot. The boot provides a high-quality fit to bike riders of all levels. The synthetic boot material is durable and this enables it to resist normal wear and tear that are associated with such high impact sports activities. The boot requires less breaking and retains its shape longer. The foam gaiter wraps the top of the boot and this offers an effective barrier to dirt and prevents it from entering the boot. The mesh lining is combined with durable synthetic material and this provides a non-slip interior. The synthetic leather is extra thick and covers the inner side of the boot. This protects it from heat from the engine. The four molded buckles are replaceable. This allows for unrestricted alignment depending on the size of your feet. The Gaerne Balance Pro-Tech boots offer outstanding flexibility and exceptional grip. It provides good foot and ankle protection. The brown color is appealing. The extremely durable boots are made with full grained oiled leather and this makes them waterproof. The high-quality materials of the boot provide great fit and are comfortable enough to wear and walk in. The boots use standard leather that are a little stiffer. The oiled version of the boots is softer and feature a waterproof liner. The three alloy replaceable buckles provide an amazing grip and ensure that the boots fit snugly on your feet. The gum rubber sole provides good grip for easy walking. The wide toe box is a great feature that is beneficial for wide footed bike riders. 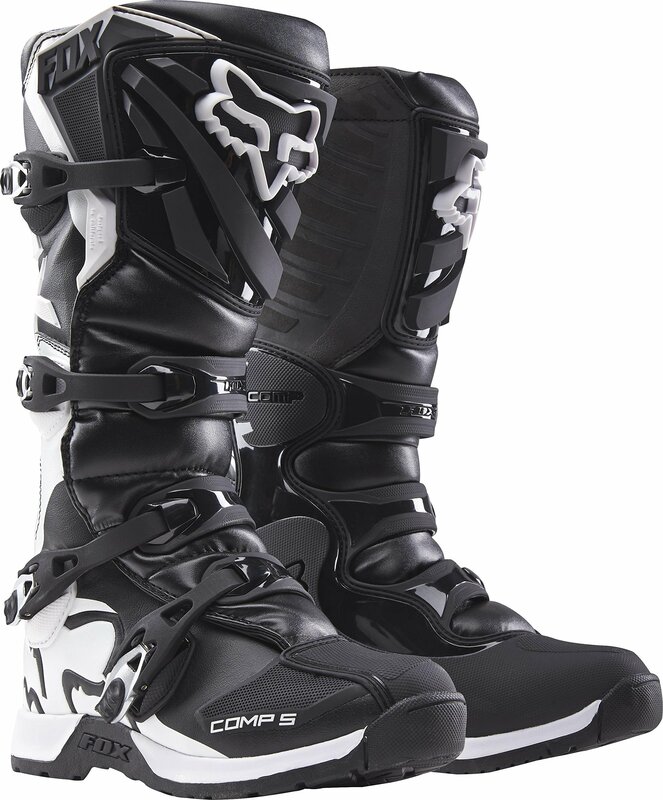 The Fox Racing Comp 5 boots are durable and can stand up to any challenges of the racing track. They have been specifically designed to provide support and comfort lap after lap, so that you can completely focus on your ride. The comfortable boots can help handle a lot of pressure on your feet. The boots look and perform like top of the line brands. The alloy buckles provide a secure closure and are easy to operate. The reinforced shin plate offers maximum protection. The many print options add style. Beginners to professionals prefer these boots for the look and feel they provide. The sole has been specially molded for each boot size and this enhances comfort and durability. The full leather upper construction has been built with all day comfort in mind. The zero-break-in time makes it extremely comfortable for time on and off the bike. The soft touch aluminium buckles can be easily closed for a good fit. 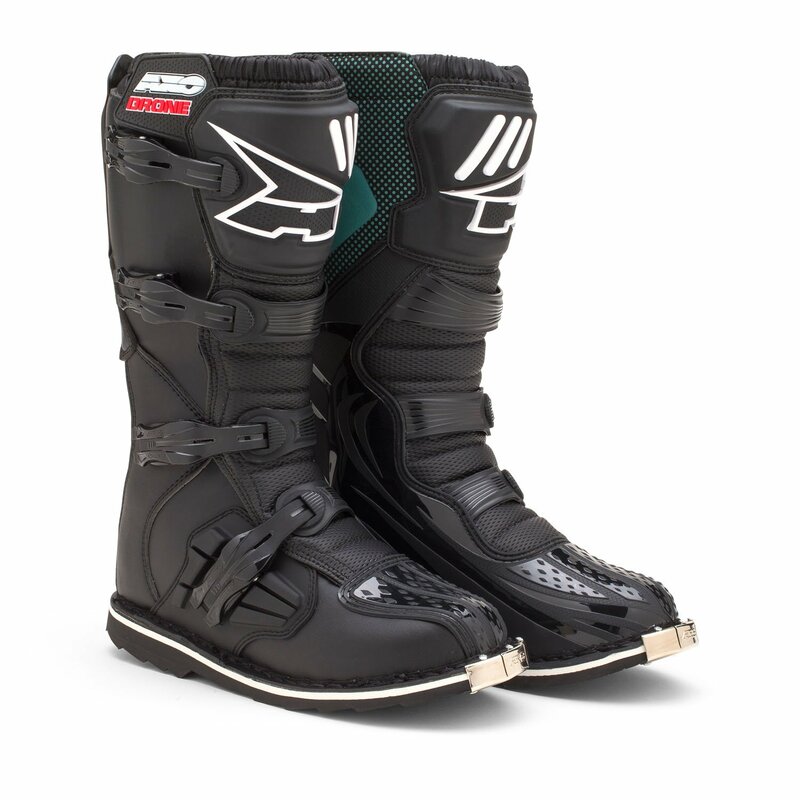 The new Alpinestars Tech 5 boots is lightweight and extremely durable. The medial pivot system is biomechanical and provides excellent levels of support and stability. The upper of the boots is constructed in an innovative manner using abrasion resistant microfiber. The toe box is constructed with synthetic polymer. The microfiber material is waterproof and is extremely durable. The material is easy to clean and maintain and is ideal for long term use. The soft polyester foam surrounds the ankles and provide shock absorbing performance. The interior textile lining provides comfort. The microfiber material is water resistant with improved weight saving and durability. The material ensures that the boot fits consistently for long term use. It is easy to clean and maintain. The shin plate provides superior impact and abrasion resistance. This gives unmatched levels of safety to your feet. The buckle straps are ergonomically designed and this helps promote high levels of front flexion. The dual compound sole offers superior grip, durability and feel when riding. The buckle system features memory and has a quick release and locking system. The buckles can be easily replaced. The advanced polymer core structure envelopes the upper boot. This gives it structural integrity. The Alpinestars Tech 7 are one of the best boots available in the premium range and are worn by professional bike racers all over the world. The technically advanced boots offer complete protection and comfort to riders as they race off the road. The replaceable dual sole give the boots extensive life and this makes it worthwhile to spend extra on them. The safety benefits of these boots outweigh the cost of buying them. The many safety features and advancements make it a preferred choice of bike riders. The upper combines advanced lightweight microfiber with full grain leather. The extensive TPU protection prevents injuries to the ankle, calf, heel, foot, toe and shin. The buckle closure system has high impact aluminium bridge closures. The self-aligning memory design improves riding performance and security. The multi density foot shell provides heel and toe protection. This makes it highly resistant to impact and abrasion and adds to the overall durability of the boot. The medial panel is constructed from one piece and this provides improved structural stability and integrity. The insert panel has rubber and provides maximum grip and improves abrasion resistance. The soft microfiber gaiter keeps out dirt and excessive water. The dual compound sole is seamlessly integrated to the foot base structure. The frontal protection has a dual closure system. The new Sidi Crossfire 2 SRS boots have been specially designed to limit ankle and foot hyperextension. The boots are lined with air Teflon mesh and cambrelle. This helps them provide added protection to the rider. 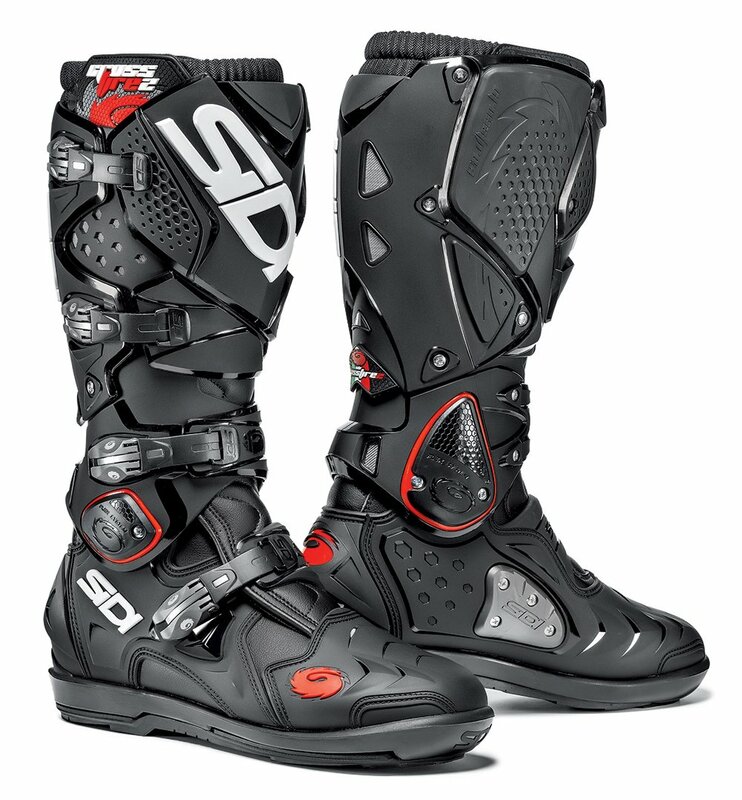 The Sidi boots have been designed for maximum protection by locking the foot down with good quality materials. Technomicro is the base material that is used in all areas of the boot. You get a good range of motion and flexibility when you wear these boots. The shin plate is made of nylon. It is inserted on a polyurethane frontal support and both parts are replaceable. The two articulated joints are the key features. The lower joint of the boots on the ankle can improve the leg flexation. The upper joint improves boot flexibility. This can enable the rider to adjust the boot strap for a better fit. The four buckle closures are indented with memory regulation straps. The buckles, straps and retaining clips can be easily replaced. The four buckles work without relating to each other. The boots have a heat resistant rubber insert that helps protect the leg from exhaust heat. The Fox Racing Instinct boots are a premium offering in the line-up of motocross boots and provides the best protection, mobility and comfort. This has made it a favorite boot in the premium range. The Fox boots have Duratac rubber sole, heat guard, hinge cover and a steel shank for support. The curved design on the top of the boot allows for a great grip. The buckles are combined with Velcro free top gaiter. This offers easy operation and unrestricted range of motion. The ample padding around the entire foot provides high level of comfort. The hinged ankle doesn’t require any kind of break-in and are good to use immediately. The hinge lockout prevents hyperextension. This helps reduce hyperflexion injuries. The hinges are also useful in preventing rotational injuries. The Duratac rubber provides durability on the sole and unprecedented grip. The rubber sole provides great traction on the foot peg. The toe box design is reinforced and this provides impact and crash protection. How to keep motocross boots in good conditions? Even the best pair of motocross boots need regular maintenance to be in good condition. Never neglect the care of your boots as they are an investment. After going for a ride, you need to wipe the dirt and mud with a clean cloth. Warm soapy water can remove any grime that is left. Apply conditioner to leather boots to prevent them from aging and cracking quickly. Motocross boots are an important piece of riding gear that bike riders need to wear at all times when riding. The boots ensure that you can safely ride off the road and even if anything happens to you, it can help prevent serious injuries to your feet, ankles and calves. When choosing boots, you need to look for comfort, durability, protection and value. A good pair of boots can offer adequate protection to your ankle, heel, toes and sole of the foot. As it is an important part of your riding apparel, you need to choose carefully, so that you can get both comfort and protection. Man, what an in-depth article on boots, well done. Those Sidi Crossfire boots look awesome.